The University of Maryland, College Park (also known as UMD, UMCP or simply Maryland) is a public research university located in the city of College Park, in Prince George's County, Maryland, just outside Washington, D.C., in the United States. 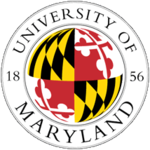 Founded in 1856, the University of Maryland is the flagship research University of the state of Maryland, and is considered to be a "Public Ivy" by authors Howard and Matthew Greene of Greene's Guides (2001), defined by the authors as a public institution that "provides an Ivy League collegiate education at a public school price". 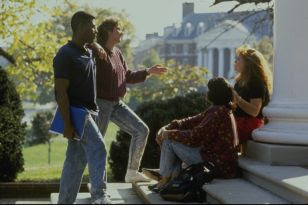 The University is most often referred to as the University of Maryland or simply Maryland, even though its formal name remains University of Maryland, College Park. The University of Maryland's location near Washington, D.C., has created strong research partnerships, especially with government agencies. Many of the faculty members have funding from federal agencies such as the National Institutes of Health, NASA and the Department of Homeland Security. It is a member of the Association of American Universities. As of fiscal year 2007, the University of Maryland, College Park's operating budget was projected to be approximately $1.352 billion. The University has also raised more than $500 million in private donations in its recent "Great Expectations" campaign. On March 6, 1856, the forerunner of today's University of Maryland was chartered as the Maryland Agricultural College (MAC). Two years later, Charles Benedict Calvert, a descendant of the Barons Baltimore and a future U.S. Congressman, purchased 420 acres (1.7 km²) of the Riverdale Plantation in College Park for $21,000. Calvert founded the school later that year with money earned by the sale of stock certificates. On October 6, 1859, the first 34 students entered the Maryland Agricultural College, including four of Charles Calvert's sons, George, Charles, William and Eugene. The keynote speaker on opening day was Joseph Henry, the first Secretary of the Smithsonian Institution. In July 1862, the same month that the MAC awarded its first degrees, President Lincoln signed the Morrill Land Grant Act. The legislation provided federal funds to schools that taught agriculture or engineering, or provided military training. Taking advantage of the opportunity, the school became a land grant college in February 1864 after the Maryland legislature voted to approve the Morrill Act. On November 29, 1912, around 10:30 p.m., a fire, probably due to faulty electric wiring, broke out in the attic of the newest administration building, where a Thanksgiving dance was being held. The approximately eighty students on the premises evacuated themselves safely, and then formed a makeshift bucket brigade. The fire departments summoned from nearby Hyattsville and Washington, D.C. arrived too late. Fanned by a strong southwest wind, the fire destroyed the barracks where the students were housed, all the school's records, and most of the academic buildings, leaving only Morrill Hall untouched. The loss was estimated at $250,000 (about $5 million in 2005 U.S. dollars) despite no injuries or fatalities. The devastation was so great that many never expected the university to reopen. University President Richard Silvester resigned, brokenhearted. However, the students refused to give up. All but two returned to the university after the break and insisted on classes continuing as usual. Students were housed by families in neighboring towns who were compensated by the university until housing could be rebuilt, although a new administration building was not built until the 1940s. A large brick and concrete compass inlaid in the ground designates the former center of campus as it existed in 1912. Lines engraved in the compass point to each building that was destroyed in the Thanksgiving Day fire. The only building not marked on the compass is Morrill Hall, which was spared by the blaze. The state took complete control of the school in 1916, and consequently the institution was renamed Maryland State College. Also that year, the first female students enrolled at the school. On April 9, 1920, the college merged with the preestablished professional schools in Baltimore to form the University of Maryland. 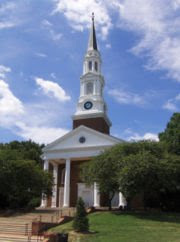 The graduate school on the College Park campus awarded its first Ph.D. degrees, and the University's enrollment reached 500 students in the same year. In 1925 the University was granted accreditation by the Association of American Universities. By the time the first African-American students enrolled at the University in 1951, enrollment had grown to nearly 10,000 students—4,000 of whom were women. 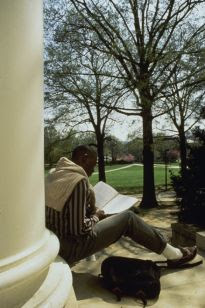 In 1957 President Wilson H. Elkins made a push to increase academic standards at the University. His efforts resulted in the creation of one of the first Academic Probation Plans. 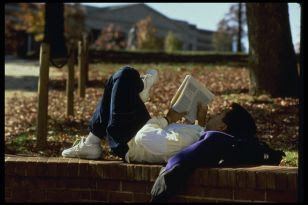 The first year the plan went into effect, 1,550 students (18% of the total student body) faced expulsion. Since then, academic standards at the school have steadily risen. Recognizing the improvement in academics, Phi Beta Kappa established a chapter at the university in 1964. In 1969, the university was elected to the Association of American Universities. 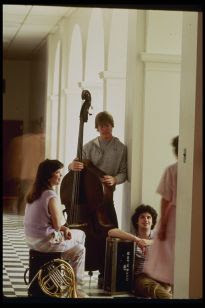 The school continued to grow, and by the fall of 1985 reached an enrollment of 38,679. On September 24, 2001, a tornado struck the College Park campus, killing two female students and causing $15 million in damage to 12 buildings. A ranking of the World's Top 200 Universities. UM is No. 14 among undergraduate programs and No. 18 among graduate programs. It is among only 12 schools to make the Top 25 in both classifications. At UM, 'even freshmen have visions of startups at these top spots (25 schools). Smith is ranked No. 8 among all the world's business schools in "Information Technology." Grist Magazine ranks UM as one of the Top '15 Green Colleges and Universities.' UM is the only U.S. state flagship university so named. The Institute of Higher Education ranks the world's top universities, based on research. The university is 18th in the ranking of national public universities. With the release of these rankings, Maryland has 29 programs overall in the magazine's Top 10 rankings (undergraduate and graduate), and 90 programs in Top 25 rankings.